"How To Start Doing Bible Study On A Daily Basis, Faster Than You Ever Thought Possible"
Is Your Lifestyle Weakening Your Spiritual Health? Are you frustrated and feeling guilty because you’re not spending enough time reading your Bible? Are you disappointed about yourself for not keeping your promise to God? Are you starting to doubt and even question your love to God? Are you beginning to wonder if it’s even possible to be consistent in your Bible Study? Are you spending more time watching television or on the Internet than you are seeking God’s Word? Obviously, the more questions you answered “yes” to, the more you need help in Studying the Word of God. Reading the Bible is one of the most important disciplines every Christian can practice. But very few Christians actually do it. Like you, our lives are busy. We have two kids, two businesses, and a unique ministry that we manage. We use to try and read the Bible every day, but failed because... between the kids, our ministry and our businesses, we felt overwhelmed and just didn’t have time for the Lord. That overwhelming feeling can paralyze you and make you less productive. What if you could stop drifting from reading the Word of God — and start to enjoy a consistent and powerful Bible Study once again? By the time you finish reading this page, you’ll discover the secret that can change your life. Just as it has for hundreds of others who’ve experienced the pain and guilt of drifting from God. Let me tell you from my 14 years of being involved in ministry, that there is an easy way to learn how to integrate Bible Study into your daily life that will have you Studying God’s Word like never before. You're Interested In Doing Consistent Bible Study,Aren't You? I don't know about you, but I get very excited when I come across information that shows me exactly what I need to succeed, especially when it comes to Bible Study. Like many Christians with busy lives, we could never get enough time for serious Bible Study. Over the last two years, Dawn and I have been working hard to develop a program for Christians just like you to read their bible on a consistent basis. We purchased books, attended lectures, took courses on time management and more. Long story short: We spent a lot of money and countless hours figuring out the best way to incorporate Bible Study into our daily lives. This course is like nothing you've ever experienced. In it, you will discover unique methods for integrating Bible Study as part of your daily routine... no matter how busy your life is. Our holistic approach offers you the latest, most refined, easy to use, AND the best methods for effective and consistent Bible Study. Each of our methods and techniques are delivered in bite-sized pieces so you won’t feel overwhelmed with information overload. Yes, the course is about how you can ratchet up your Bible Study by learning little known methods and how to use them effectively. How to turbocharge your Bible Study in the shortest time possible. It’s the quality - not quantity. How to keep practicing a daily Bible Study and avoid overwhelming obstacles that keep you away from it. How to shun the stunning lies of the enemy that he’s implanted in your thoughts. How to avoid the shocking excuses most Christians have that lead to procrastination. How to bust through the boredom whenever you’re studying the Bible. How Spirit Filled Christians manage to keep consistent in their Bible Study regardless of how they feel. How to use new tools and technologies to help you Study the Bible better and faster. How to know God’s revelation to you every time you open your Bible. 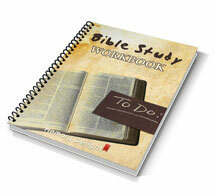 How to use the simple and easy to follow framework for Bible Study. How to make Bible reading enjoyable, fun and become a healthy addiction. How to transform your Bible reading into a powerful experience. How to prevent procrastination from derailing your Bible reading plans. How to find a Bible Buddy to walk with you in your journey to knowing God’s Word better. How to manage your time to make Bible Study a habit and be part of your life forever. This course will revolutionize the way you approach your Bible Study with powerful strategies that will give you that Bible Study breakthrough you’ve been looking for. Are you beginning to see the ways Bible Study For Busy People: The Simplest and Easiest Way To Study God’s Word can help you? Notice your excitement to Study your Bible has increased dramatically. You’re so into it while Studying the Bible that you didn’t notice how much time had passed. When you purchase this course for yourself, you'll find yourself becoming more and more skilled at Bible Study and strengthening your spiritual fortress. Maybe it's not the best-written book in the world, but Bible Study For Busy People: The Simplest and Easiest Way To Study God’s Word contains the strongest, easiest to learn and fastest techniques for your Bible Study success. NOTE: Please realize Bible Study For Busy People is a serious course about creating effective Bible Study and integrating it into your daily life… and it requires the same attitude from you. You get a comprehensive course, which includes the book and workbook. You also get an audio version of the book jam-packed with information for you to learn from when you’re “on-the-go”. This short but powerful guide contains 6 sections and 49 short pages that will help you overcome the obstacles keeping you from having a consistent and meaningful Bible Study. It will also teach you tools and techniques on how to make the most out of your limited Bible Study time. Get the entire course on audio so that you can listen on the go… anytime, anywhere, 24/7 - while you do other things like: commuting to work, waiting to pick up your children from an activity, working out at the gym, exercising at home, doing household chores, jogging, walking, driving, mowing the lawn or doing other outside work, at night while your partner sleeps (you won't keep them awake by having a light on), and much, much more! This actionable workbook will help you develop your personal system of Bible Study.With the help of this workbook, you’ll develop your own system that will fit perfectly into your daily schedule. This one of a kind course is available as an instant download. No waiting for the mail to deliver it to your door. You’ll get access to this great course instantly and begin Studying the Bible as soon as you download it. Bible Study for Busy People: The Simplest and Easiest Way To Study The Bible is not available anywhere but here at Memory Delight. This Sounds Great But How Much Does This Course Cost? Let's do a quick comparison – You could pay hundreds or thousands to attend seminars with someone who may or may not truly understand Bible Study. The other option is for you to shell out $75.00 - $150.00 or more buying up all kinds of expensive books that will most likely only sit on your shelf gathering dust. 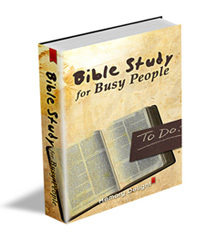 This sensational resource, Bible Study For Busy People: The Simplest and Easiest Way To Study God’s Word, is available to you as a downloadable manual (or ebook) as well as an audio version instantly accessible from the Internet. This way we have no inventory and no fulfillment costs. We don't need to pay anyone to take the orders over the phone (though, you are welcome to call us at 1.800.680.1119 to be rest assured we are a real company). This way we can pass along our cost savings to you. Thousands of people across North America have paid between $1,000 to $5,000 to attend seminars to learn these breakthrough techniques. And it was money well spent. But now, you can save all your money from the hype and get solid information to grow your Bible Study into a daily practice. Your total investment for the entire course is just $27.00. Since you're in a Bible Study bind just like we were, we’d really like to help you get into Bible Study the fastest way possible… So we all win! "Take-It-To-The-Bank" 100% Guarantee For The First, Full 2 Months Of Your Purchase"
We put our hearts, souls and our most prized and treasured information and secrets of effective Bible Study into this course for you. Here's our challenge to you: Invest in yourself with this system and put it to use. After studying and following our instructions in this powerful Bible Study course, if you are unsuccessful in doing Bible Study on a daily basis… simply show us proof of your efforts and we’ll gladly refund the full purchase price of this course. Purchase your copy today. Instantly download the PDF’s and audio content and listen to every recording, read every word, do the exercises in your workbook and apply everything you’ve learned… Right down to the very last day. If at any time during those first 2 months you’re NOT completely convinced that Bible Study For Busy People: The Simplest and Easiest Way To Study The Bible is worth the price of your purchase many times over, we want you to ask for your money back. We’ll refund you for the entire amount, on the spot. Just give us a call at 1.800.680.1119 or email us at [email protected] and we’ll give you a full refund. When you first receive Bible Study For Busy People and you start to go through it, you’ll get excited about the possibilities...and then, when you start to use them you think, "My goodness, this stuff really works!" ...Isn't it time for you to do what works? You've taken the first step onto the path of effective Bible Study by coming to this website, why not take the next step and order the course today? Once you've made the decision to increase the effectiveness of your Bible Study, keep it in mind as you place your order. Click here for your instant download of this course. Once your credit card is approved, you will be taken to a special download page where you will download everything immediately. You will download and learn from this breakthrough information in just minutes... and then use it to master effective Bible Study! Order Below For Instant Access... It doesn't matter if it's 3:00 A.M. in the morning! Yes Don and Dawn, I want to order Bible Study For Busy People: The Simplest and Easiest Way To Study The Bible and discover how I can easily practice Bible Study every day with this incredibly simple system! With my order, I realize I have a full 60 days to review this course. If, at that time, I decide this course is not for me, I can request a full refund - no questions asked. Simply click the button below to place your order, and you will be transferred to the download page immediately following your payment. Your order is guaranteed safe and secured. With the marvelous power of the Word of God you can work wonders, strengthen your own will and actions, and with ordinary intelligence, master the secrets of effective Bible Study. P.S. Everything you're about to learn is tried and tested material. This will apply to your Bible Study not just once, but for many years to come. It's an investment not just for today - but for the rest of your life. P.P.S. Remember, this is 100% risk free. If for any reason you don't believe that you got your moneys worth, just contact us, show us how you put these techniques into action and we'll give you a full refund. That's how confident we are that this really does work. P.P.P.S. From the moment you dive into Bible Study For Busy People: The Simplest and Easiest Way To Study The Bible, you'll feel great about increasing the effectiveness of your Bible Study – you will gain mastery in no time. Click here to receive your copy﻿.